Reginald Harry Maltby was born on 24 January 1882 in Fulham, south London and in 1903, married Beatrice Lubbock. They had two children, Reginald Charles, born 1903 and Freda May 1906. In January 1909, Reg enlisted with the London Electrical Engineers (RE Territorial Force) and was called up for full time service on 5 August 1914, at the outbreak of World War I (1914-1918). He spent all of the war in the UK with the Royal Engineers as a motor engineer but did not receive any medals because he had not served overseas. Demobilised on 21 May 1920 Reg only spent a short time on civvy street for on 11 March 1921 he enlisted in the Tanks Corps, joining the 11th Armoured Car Company two months later. On 11 February 1922, the Company sailed for India and then travelling to Kirkee (now Khadki), near present day Pune on the Deccan plateau. One section of the Company remained on attachment duty at Bombay, present day Mumbai. It was whilst he was in Kirkee that Reg received the Territorial Efficiency Medal and promoted to the rank of Corporal. 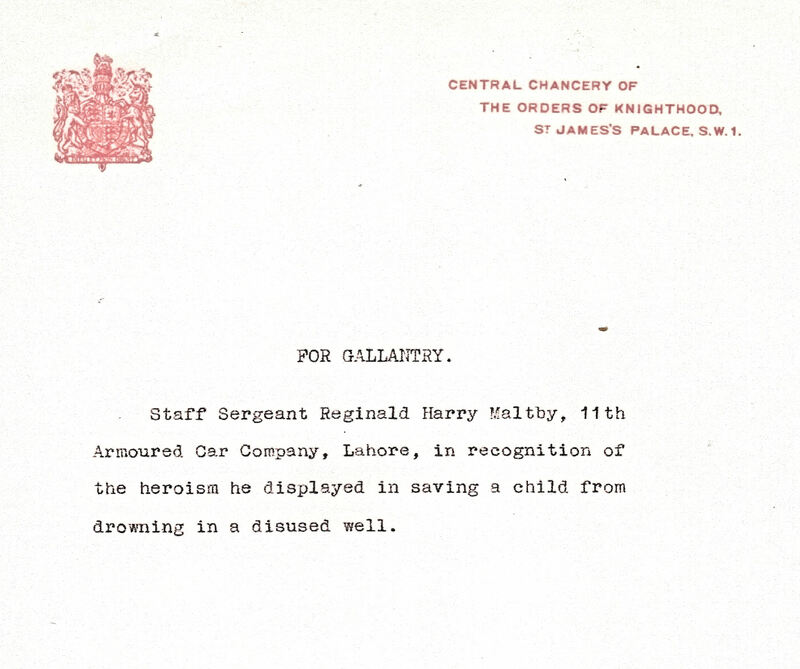 The Armoured Car Company moved to Lahore on 3 January 1925 and Reg had been promoted to Staff Sergeant. On 18 January 1926 G.H. 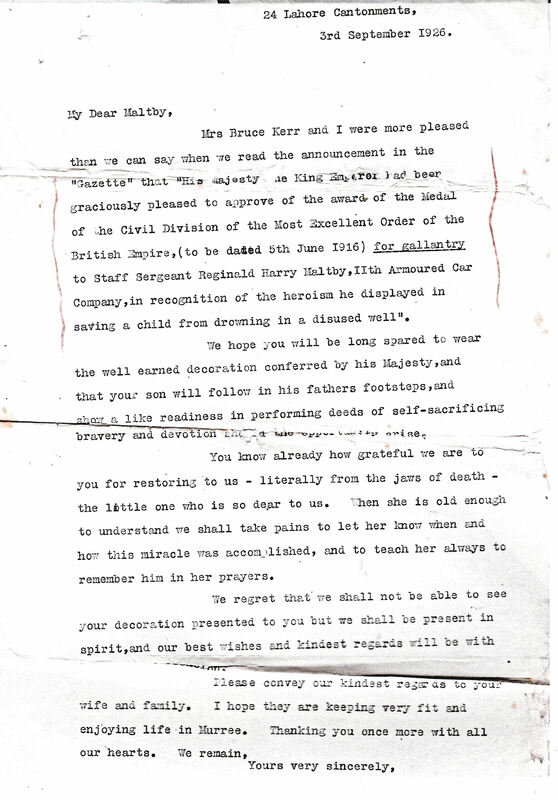 Bruce Kerr, Chaplain to the Lahore Cantonment wrote to the Commanding Officer of the Royal Tank Corps, Lahore bringing to his notice the ‘very prompt and gallant assistance rendered by Staff Sergeant Maltby,’ in rescuing his 3½ year old daughter from drowning. That afternoon Reg along with Captain Wilton, were walking across the compound to the latter’s car, which Captain had asked Reg to look at. Mrs Keer, the wife of the Chaplain ran to them and was evidently agitated. She said that the ground had suddenly given way under her daughter and had disappeared. The Captain realised at once that the little girl had fallen down a disused well. The little girl could be heard crying and splashing around. The well was about 2-feet square and some 30-feet deep. The Captain found some old rope, which Reg tied around himself and with the help of the Chaplain, Reg was lowered into the crumbling well. As he made his way down, the falling soil was turning water into mud that became thick and sticky. By the time Reg reached the little girl, she had been sucked under the mud. Pivoting himself against the well walls, Reg managed to ease the little girl out of the gluey mud. He then climbed the disintegrating shaft walls carrying the little mite until safety was reached. Although, initially traumatised the little girl quickly recovered from the experience and did not suffer any physical damage. As for Reg, according to the Captain, after a little refreshment he returned to work. On receipt of the Chaplain’s letter and another from Captain Wilton, Reg was recommended for the Albert Medal by the Senior Commanding officer of the Lahore District. The EGM was instituted on 29 December 1922 and was just over an inch wide, suspended from a purple riband with the words ‘For Gallantry’ etched below a depiction of Britannia. However, those who were awarded the EGM were not able to use the letters after their names. The Colonel Commandant of the 7th Indian Infantry Brigade, Razmak presented the Medal to Reg, on the Northwest Frontier on 24 January 1927. Not long after Reg was promoted to Warrant Officer Class Two and returned from India in 1928 on the SS California. His final posting was on 4 October 1932 to the 3rd Battalion Royal Tanks Corps at Lydd, Kent. There he stayed until finally discharged from the Army on 3 August 1938, holding the rank of Warrant Officer Class Two. On 10 July 1937, a Royal Warrant was issued that allowed recipients of the EGM to use the letters after their names. The Royal Warrant also allowed for a small silver laurel branch emblem to be worn on the riband to denote that it was a gallantry award. 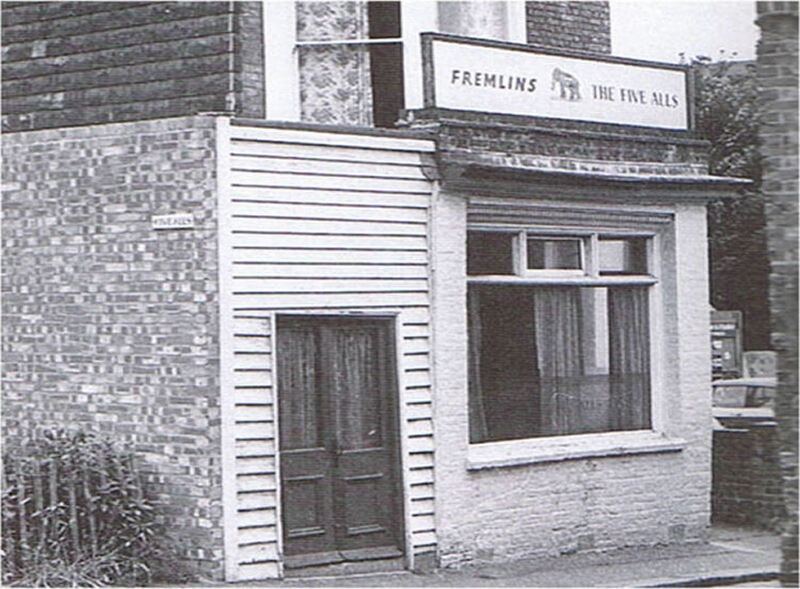 Reg was considered too old for further service when World War II (1939-1945) broke out and so he and his wife remained licensees of the Five Alls. 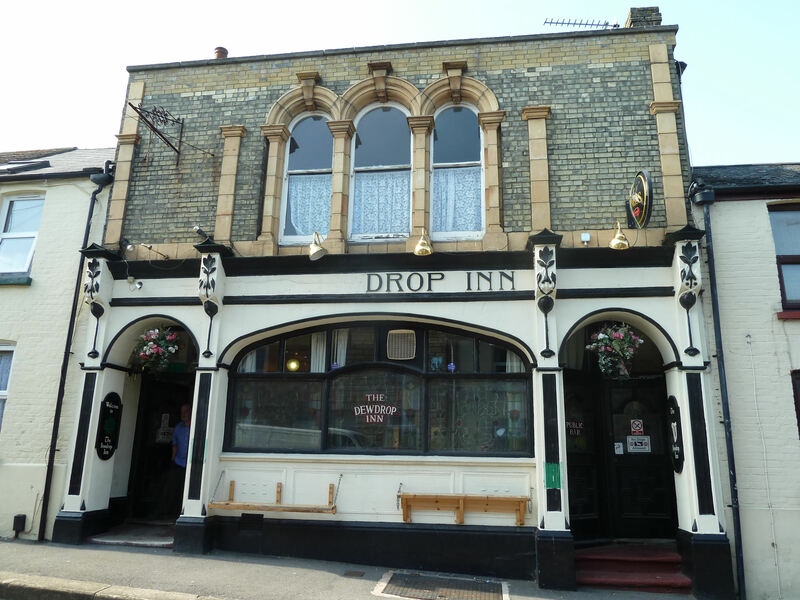 In January 1940, the couple took over the Dew Drop Inn, in Tower Hamlets but on 17 December 1943 age 62, Reg died of a cerebral haemorrhage. The funeral took place on Tuesday 21 December 1943 at Charlton Cemetery and was conducted by Rev James Embry, St Bartholomew’s Church, London Road. Besides Reg’s wife, son, daughter, and their spouses, the others present were Mrs P Doolin, a close friend of the family, W Drennen and N Staines, president and secretary of the Dover Licensed Victuallers Association and representatives of the Peace and Harmony and the Military Jubilee Masonic Lodges. A small tablet with the inscription ‘Reginald Maltby O.B.E. 1882-1943’ was placed on his grave. At that time the OBE or more formerly, the Order of the British Empire, was often confused with the EGM. In fact, on 24 September 1940, it was the George Cross that had superseded the EGM. Of interest, a total of 130 EGM’s had been awarded between 1922 and 1940. 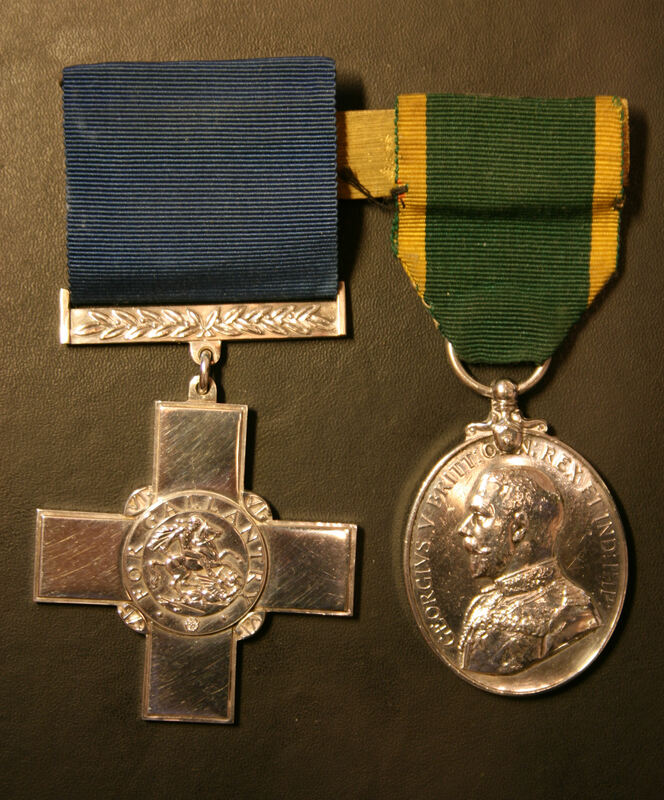 After the war, Beatrice sought to have Reg’s medal exchanged for the George Cross but as only holders of the EGM still living were eligible, this was refused. Beatrice was persistent and by special request, on 15 April 1948, George VI allowed the exchange to take place. 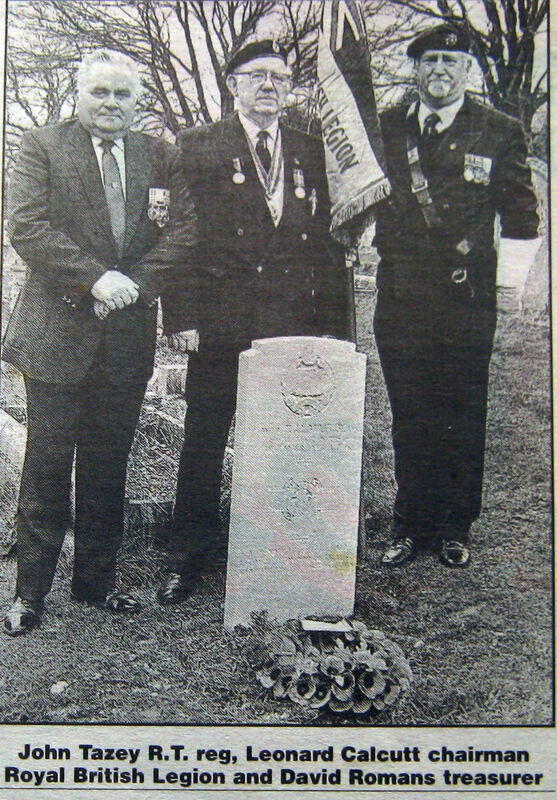 In the 1990s, the late Bill Green, a member of the Orders and Medals Research Society was undertaking a piece of research on the recipients of the EGM and noted that Reg’s grave was unmarked. He decided to do something about this but it was a long uphill struggle to try to raise interest in providing funds to buy an appropriate headstone, In the end, Bill organised a traditional ‘whip-round’ and donations came in. On 6 January 1998, at a moving ceremony, with his family present, the £700 headstone was dedicated. With the Regimental badge centred on top, underneath is inscribed: Ex-W.O.II R.H. Maltby G.C. Royal Tank Corps, Born 24 January 1882 Died 17 December 1943. The George Cross emblem is in the centre of the headstone. Thanks to Tony Belsey for bringing Reg Matby’s story to my attention and Mike Maltby for the sight of the original documents. This entry was posted in Armed Services, Maltby Reginald GC - Remembered, Maltby Reginald GC - Remembered, People. Bookmark the permalink.